With a rapidly growing audience of gardening enthusiasts, Garden Answers is the champion of guilt-free gardening. The magazine features design inspiration, planting ideas and friendly, expert advice to create a beautiful garden whatever the season. Each issue of your Garden Answers Subscription will feature seasonal plants to buy, practical jobs for the month ahead, clever ways to save time and money and fantastic reader gardens packed with ideas to inspire everyone. If you’re looking for inspiration, keen to expand your gardening knowledge, and want create your own personal haven packed with beautiful plants showing year-round colour, Garden Answers Magazine is the perfect choice. Order your subscription today and get inspired. 253 plants for seasonal wow… Shortcuts for spring – experts share their tips for quick and easy gardening… Get the natural look with small trees, grasses and meadow flowers… Meet the queen of self-seeders… Squeeze in some veg – fill in the gaps with plants you can eat… Give the mower a rest – learn the secrets of long grass… 25 time saving tricks to mow and water less… Give bees a hand with a buzzing flower buffet… Stunning shrubs that fill space fast… Create drama with focal points… Get your colour fix – hardy plants for a patio pot… Be wildlife friendly – beat pests without chemicals… Order your Garden Answers subscription today for more insightful articles like this every month. 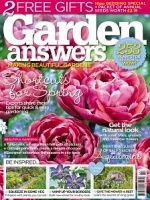 Who Reads Garden Answers Magazine? With an average age of 58, Garden Answers readers have been enthusiastic about gardening for a long time and are active gardeners all year round.